Gorgeous gated estate home offering nature lover's paradise. Experience peace & tranquility daily from your pool view looking out over water & conservation. No need to build when you can own this 2.4 year old energy efficient Meritage home with solar panels. Seller recently added a spectacular pool & a summer kitchen! This 8 bedroom 5 bath 3 car garage 5288 ht. sq. ft. pool home has low monthly power bills! Spacious master suite is downstairs along with a guest bedroom or office & the pool bath. There is also a master size bedroom with adjacent bath upstairs along with a huge bonus-game room complete with wet bar & wine cooler! You will appreciate the mud room area off the garage! The elegant first floor has 24" by 12" neutral stone tile in the living room dining room family room foyer hallways guest room laundry room & kitchen. The gourmet kitchen offers a butler's pantry quartz counter tops upgraded wood cabinets marble back splash 5 burner cook top built in oven & microwave stainless steel & glass vent & huge island with snack bar. The master suite has hand scraped wood floors & 24" by 24" marble tile in the master bath. 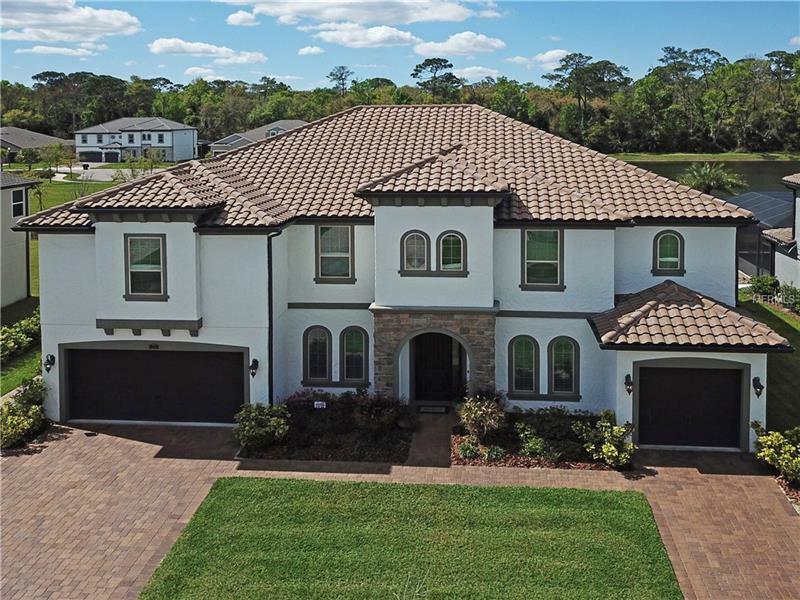 This light & bright home offers neutral colors & dramatic custom features such as hardwood staircase with iron railing 8' classic craft entry door & designer lighting. See available feature sheet for a detailed description. Oviedo offers top rated schools a new downtown with shops restaurants open air theater dog park & splash pad & playground.